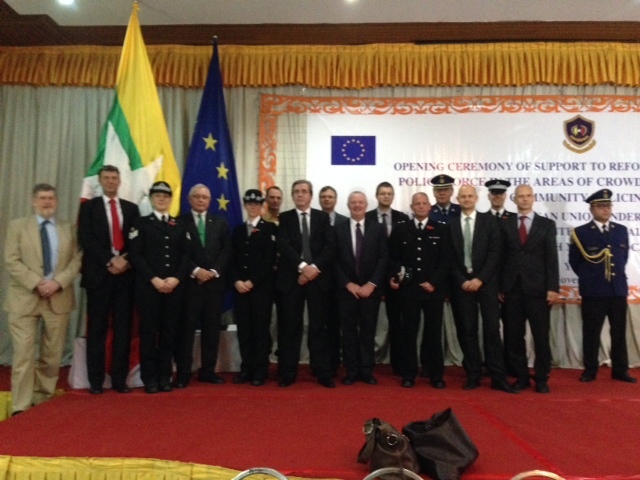 NI-CO’s community policing expert, Mr David Hamilton, has recently arrived in Naypyidaw, Myanmar to start work on an EU grant which has been financed under the Instrument for Stability (IfS) Exceptional Assistance Measure to provide support to the Myanmar Police Force. Led by IMG in Brussels, the 18 month project will aim to bring expertise from across EU member states to assist the Police to improve their overall efficiency, accountability and public image. As well as addressing strategic command issues, crowd management and human rights, the project will attempt to introduce a community policing ethos in an attempt to prevent increasing communal, inter-religious and protest related violence. The NI-CO team, led by Mr Hamilton, will be supported by the British Council. Experts, resourced from across the UK, and will work alongside the Myanmar Police and other relevant stakeholders in the development of a community policing strategy that will engage proactively with different parts of the community and foster a relationship that is built on mutual trust, information sharing and co-operation. To support the ongoing Public Administration Reform agenda through activities which will strengthen the capacity of local government to achieve effective, efficient, service delivery and develop a culture informed decision making through the development of a systemised approach to planning.